HOLBROOK, N.Y. – Mobile Industrial Robots (MiR) reached production capacity for its new MiR500 autonomous mobile robots (AMRs) in its first month. 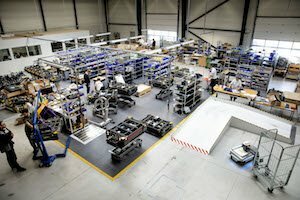 With plans in place to deliver all current orders by the end of 2018, including the 40 percent purchased by U.S. manufacturers, the Denmark-based robotics manufacturer says it will double production of the MiR500 in November by hiring additional resources and optimizing production. “We were blown away by the positive response we received from U.S. manufacturers when we first introduced the MiR500 at IMTS in September,” said Ed Mullen, vice-president – Americas, Mobile Industrial Robots. 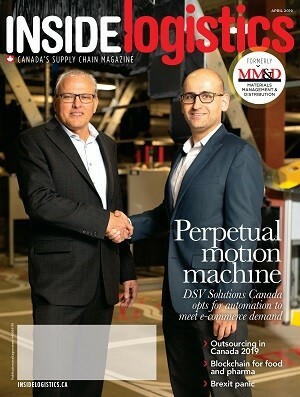 Patrick Garin, CEO of Cabka North America, one of the largest manufacturers of plastic pallets, already sees this value. “This is a dream come true for us,” he said. The MiR500 is designed to transport of heavy items and pallets, with two flexible pallet lifts for the two most commonly used types of pallets: the EU pallet and the 40” x 48” pallet. The robot has a lifting capacity of 500 kg (1,102 lbs) and can automatically collect, transport and deliver pallets. The MiR500 incorporates the same innovative safety features as the rest of the MiR product line. Using MiR advanced technology and sophisticated software, the MiR500 can recognize obstacles in a 360-degree radius, allowing the robot to navigate autonomously via the most efficient route to its destination – even in dynamic environments where people and vehicles are moving.